Ghasemi, A., Davarpanah, A., Ghadiri, M. (2012). Structure and Magnetic Properties of Oxide Nanoparticles of Fe-Co-Ni Synthesized by Co-Precipitation Method. International Journal of Nanoscience and Nanotechnology, 8(4), 207-214. A. Ghasemi; A. M. Davarpanah; M. Ghadiri. "Structure and Magnetic Properties of Oxide Nanoparticles of Fe-Co-Ni Synthesized by Co-Precipitation Method". International Journal of Nanoscience and Nanotechnology, 8, 4, 2012, 207-214. Ghasemi, A., Davarpanah, A., Ghadiri, M. (2012). 'Structure and Magnetic Properties of Oxide Nanoparticles of Fe-Co-Ni Synthesized by Co-Precipitation Method', International Journal of Nanoscience and Nanotechnology, 8(4), pp. 207-214. Ghasemi, A., Davarpanah, A., Ghadiri, M. Structure and Magnetic Properties of Oxide Nanoparticles of Fe-Co-Ni Synthesized by Co-Precipitation Method. 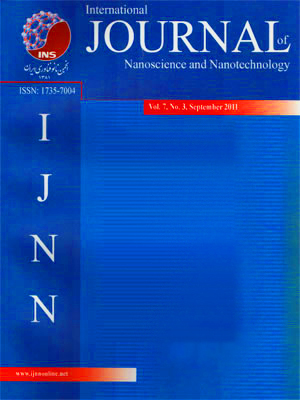 International Journal of Nanoscience and Nanotechnology, 2012; 8(4): 207-214. Oxide nanoparticles of Fe-Co-Ni were prepared in six different compositions by co-precipitation method. The as-synthesized nanoparticles were characterized by X-Ray Diffraction (XRD), Field Emission Scanning Electron microscope (FESEM), Fourier Transform Infrared (FT-IR) and Vibrating Sample Magnetometer (VSM). It was found that the nanoparticles had mean crystalline size of 30-55 nm and spherical shape. Specific surface area of the nanoparticles was between 27.47x104 cm2/g to 141.4x104 cm2/g which had been calculated by X-Ray Diffraction data. The magnetic measurements of nanoparticles were done at room temperature and found that nanoparticles exhibit a ferromagnetic behavior with different values of saturation magnetization and coercivity.